The sound of a boys' choir is so exquisite that even Joyce Keil, the founder of Ragazzi, the Peninsula Boys Chorus, struggles to describe it. "A boy's range has a kind of richness to it, " she says. The voices can be smoother than girls' voices, although they're almost as high-pitched. Unfortunately, this pure, no-vibrato sound has a short lifespan. When the boys hit 12 or 13, puberty kicks in and their voices crack. They can't hit the high notes anymore, and even the low notes sound rough and uninviting. "They become alums of Ragazzi, " Keil says. "There's really this dying swan quality to it. The voices are the most beautiful right before they crack." It's a beauty that has been harnessed by church choirs for centuries. The world's most prestigious children's choir, the Vienna Boys' Choir, was founded in 1498 by Maximilian I to perform in the chapel of the Hofburg, where they still perform today. But boys choir music predates the Vienna choir. 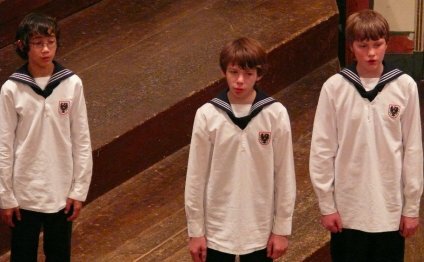 In the beginning, boys choirs existed because Medieval churches forbade singing by women and girls. "It belonged to guys, " Keil says. "Men and boys' choirs were the original choirs. Bach's original music was performed only by boys and men." Eventually, however, even after girls and women were allowed to sing in church, composers and conductors realized that there was something special about prepubescent boy voices. For a time in Europe, churches tried to preserve the incredible voices of some boy singers through castration, a practice that was pervasive in the 1700s, fading out through the 1800s. Keil says boys choirs are still mired in some controversy today. Some resent them because of their sexist roots. To boot, they exist today because many believe that prepubescent boys' voices are "superior" to girls voices. "It's a tricky thing because some say it's not right to keep girls out of a boys' choir, " Keil says. But one boys' choir in New York recently started admitting girls, only to find the number of boys dwindle from 20 to three, Keil says. "The boys need an identity of doing something together, " she says. "Give the girls something else wonderful to do, but don't mix them together." Keil says she has been attracted to the camaraderie that exists among the members of an all-boy choir ever since serving as assistant music director for the San Francisco Boys' Chorus. She founded Ragazzi (which means "boys" in Italian) in 1987 with seven young singers. Today, the choir draws members from as far away as Santa Cruz and Brisbane, with about half the membership coming from the Midpeninsula. "I really saw the need for a boys' chorus on the Peninsula, " she says. The year after she started it, the number of participating boys went up to 35, and rose to 70 the following year. This year, the group has 75 boys. Although their sound could be described as angelic, Keil says the boys aren't always little angels. "Someone once told me, 'I guess boys who sing are not as rowdy as other boys, '" she says. "I said, 'Wrong.' The moment they're out of my sight, they're punching each other and whatever it is boys do. They need to be guys first. When they're with other guys they can reinforce that, and give vent to a whole other artistic side of themselves." "There are some misbehaviors, " admits 13-year-old Ragazzi member Jansen Verplank. "But it's not too bad. We have leadership positions to help keep discipline with the boys." Ragazzi member Nick Pleasure, 12, says he joined the program with the hope of gaining leadership experience. Although he's been one of the group's top singers over the past two years, he says he doesn't love all the music. "This is just something to do, " says the Pacifica resident. I wanted to see if I could propel myself up in the ranks." He has indeed. He's serving as head chorister this year, and takes over conducting whenever Keil has to step away from the group. Unfortunately, this is going to be his last year in Ragazzi. "Nick is in the middle of crack right now, " says his father, Doug, who also volunteers with the group. "Cracking makes them feel like they're growing up. They're entering manhood."